Richard M. Goldberg concentrates in bankruptcy, creditors' rights, workouts and commercial litigation. He has achieved favorable results for debtors, creditors’ committees and trustees in numerous large corporate reorganizations, Chapter 11 and Chapter 7 proceedings and complex multi-party, out-of-court workouts. Mr. Goldberg has considerable experience representing financial institutions, developers, retail chains, home builders, commercial landlords, specialty lending institutions, trustees, insurance companies and government agencies in all aspects of Chapter 11 reorganization cases, Chapter 11 liquidations and large Chapter 7 liquidations. He has also successfully represented numerous parties seeking to acquire assets from bankruptcy estates. In addition to his experience in traditional bankruptcy areas and the significant litigation that arises within most bankruptcy cases, Mr. Goldberg represents parties in a wide variety of commercial litigation matters, including commercial contractual disputes, commercial real estate transactions and the Uniform Commercial Code, in state and federal trial and appellate courts. Widely respected for the depth of his knowledge, he has been declared and has testified as an expert witness on commercial transactions, commercial litigation and the reasonableness of attorney fees in commercial litigation and transactions. 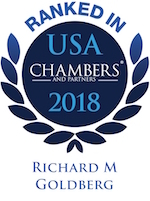 Chambers USA and Best Lawyers in America name Mr. Goldberg among the leading bankruptcy and creditors' rights attorneys in the country. Mr. Goldberg currently represents the bankruptcy court appointed Chapter 11 Trustee in the Vincent L. Abell bankruptcy case. Mr. Goldberg, as lead bankruptcy counsel, has successfully recovered for creditors nearly $20 million to date. (See Super Lawyers Magazine story on this case: "An Empire of Concealed Assets".) This bankruptcy case centers on the Trustee’s allegations that the debtor (along with related parties) has “continuingly concealed” his assets from creditors by a series of interrelated schemes. This case has been extraordinarily litigious resulting in innumerable trials in front of the bankruptcy court, appeals to the United States District Court and 4th Circuit Court of Appeals (each of which Mr. Goldberg has prosecuted successfully), and numerous matters in front of the D.C. Superior Court and regulatory agencies in Washington D.C.
Mr. Goldberg represents the largest creditor/acquiring party of the majority of equity interest in the Redox Power Systems, LLC bankruptcy case pending in the Greenbelt Division of the U.S. Bankruptcy Court for the District of Maryland. In this representation, significant disputes arose with founding equity holders resulting in substantial litigation, including Mr. Goldberg's successful joint prosecution with the Debtor of a lengthy, contested confirmation hearing. Redox is a high-tech company attempting to design and market solid oxide fuel cell devices used for the production of clean and economically produced electricity. Mr. Goldberg represents a highly reputable local law firm which is a large creditor in a bankruptcy case. Mr. Goldberg serves as lead bankruptcy counsel to his partner, Joel I. Sher, who is the court-appointed Trustee in the Chapter 11 bankruptcy cases of TMST, Inc. and its affiliates, formerly known as Thornburg Mortgage, Inc.
Mr. Goldberg successfully represented Heaver Properties, LLC, the owner of a 112,000 SF commercial building just north of Towson, Maryland in an out-of-court workout with its tri-party lending group that resulted in the sale of the building to a third party. 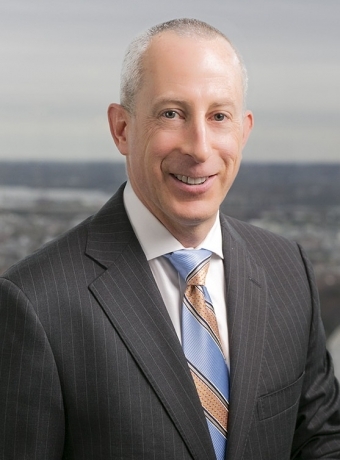 Mr. Goldberg represented Charles County Maryland in connection with workout issues and bankruptcy "ring fencing" related issues in a dispute with the County's largest taxpayer, the owner of an electric power generating plant. Mr. Goldberg represented the bankruptcy court appointed Chapter 7 Trustee in the ExpoEmart, LLC bankruptcy case, a case that concerned a failed ethnic grocery store in the Washington D.C. suburbs successfully negotiating a sale of the grocery store to a new operator for $500,000, and simultaneously resolving in excess of $1.5 million of claims against the bankruptcy estate held in favor of Safeway, Inc.
Mr. Goldberg represented one of the largest developers/ business owners on the eastern shore of Maryland in an out-of-court workout involving approximately $50 Million in several layers of debt and with several lenders. Mr. Goldberg represented a party in a complex litigation dispute concerning a real estate development financed in part pursuant to a complex Historic Tax Credit program. In past significant mortgage company related matters, Mr. Goldberg successfully represented Fieldstone Mortgage Company, obtaining approval of its Chapter 11 plan. The client became one of the only mortgage lenders to survive bankruptcy proceedings in the wake of the real estate credit crisis. Mr. Goldberg has served as regular bankruptcy counsel to GEICO, handling bankruptcy-related matters in which the insurer is involved, including disputes with debtors under various contractual agreements and lawsuits brought against GEICO filed in bankruptcy courts. As counsel to the unsecured creditors committee in the Chapter 11 case of PhyAmerica Physician Group, Inc., a physician practice management company, Mr. Goldberg and the Shapiro Sher bankruptcy team engineered a hostile takeover of the debtor companies that resulted in a payout of 75 percent of the creditors’ claims, an unusually favorable outcome for unsecured creditors. Mr. Goldberg represented the Chapter 11 trustee in a series of complex bankruptcy cases concerning several related satellite companies owned by an individual under indictment for violation of federal statutes. Mr. Goldberg’s client prevailed in every contested matter, including three appellate decisions. Deeply experienced in the real estate industry, specifically in connection with bankruptcy matters, Mr. Goldberg has represented Ryland Homes, Elm Street Development, home builder Caruso Homes, Inc. (in its Chapter 11 case), the Chapter 7 Trustee of Regency Homes Corporation and 12 subsidiaries in the liquidation of the companies, and numerous other developers and purchasers of raw, developed and fully completed commercial and residential real estate projects. Of note, Regency Homes had been one of the largest home builders in Maryland and Virginia. Upon filing, Regency had more than $50 million in claims against it, including approximately $35 million in secured debt. Mr. Goldberg negotiated and consummated several sales of Regency Homes’ assets that resulted in the reduction of secured and unsecured claims of approximately $35 million. In past “continuing concealment” bankruptcy matters, Mr. Goldberg engineered a $1.53 million settlement between a Baltimore landlord and ground rent owner, and the trustee in that individual’s bankruptcy case. In this matter, Mr. Goldberg served as counsel to an attorney representing numerous plaintiffs who had brought and obtained multi-million dollar lead paint claims against the landlord. Mr. Goldberg has extensive experience representing clients in cases that involve government contracting. He represented the Chapter 7 Trustee in the bankruptcy of Information Networks, Inc. (d/b/a Infonetics), a minority contractor that provided technology services to several federal agencies. Mr. Goldberg has served as bankruptcy counsel to the U.S. Small Business Administration in connection with failed Small Business Investment Companies in which the SBA made debt or equity investments pursuant to the Small Business Investment Act. For the SBA, he has successfully navigated disputes involving several franchisees of prominent national restaurant and retail chains, such as Popeyes Louisiana Kitchen, Friendly’s Ice Cream Stores, and Party Land. These disputes focused on the value and ownership of the equity interests and the respective rights of the debt and equity players. Past President and Board Member, Bankruptcy Bar Association for the District of Maryland; Past Chair and Vice Chair of the Baltimore Division of the Bankruptcy Bar Association.